A smile makeover can often be simple and doesn’t always mean any drilling or injections are required. But more often some more advanced treatment is required. You can be sure to receive the latest treatments at The Fenton Dental Studio to enhance your smile. We will always check the whole mouth before recommending any treatment to make sure your new smile will stand the test of time. This may mean that some preventative treatments are required first of all to get the whole mouth healthy but it is always worth it in the long run. Always build on a solid foundation! Veneers are thin shells of porcelain that are bonded to the front of the tooth. Veneers can cover anything from cracks to severe stains. They can also close gaps between teeth and give your smile a more uniform appearance. Veneers are ideal for healthy teeth that need sprucing up. They’re the perfect solution if you want a truly dramatic smile transformation. Crowns and bridges can restore damaged or missing teeth. These fixed, permanent restorations are bonded to the tooth or attached to dental implants. Crowns are often tooth-colored coverings that hide the entire visible portion of the tooth. Crowns are used to restore a tooth that is severely damaged. If the tooth is very weak and can no longer support fillings, inlays, and onlays, it is capped with a dental crown. The tooth is cut and prepared and the crown is cemented on to the remaining structure. Crowns can also be attached to dental implants to replace one tooth or several missing teeth. Crowns are usually made from porcelain, composite resin, gold, alloy, or porcelain fused to metal. The type of material used will depend on the location of the tooth, the extent of damage, and your preferences. Metal and gold are known for their durability and strength, but not for their appearance. All-porcelain is natural-looking, but it can break under extreme chewing forces. A good compromise is a metal foundation with a porcelain covering. A bridge is a fixed appliance that fills gaps left by missing teeth. The standard bridge has two components: two crowns capped over teeth on either side of the space (abutment teeth) and another crown in the middle (pontic). Sometimes, the abutment teeth are placed only on one side of the gap. Metal “wing” attachments can also be used instead of crowns to anchor the replacement tooth. 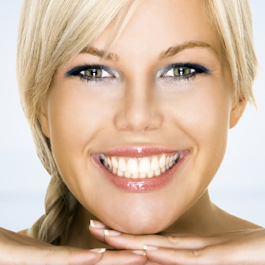 Tooth whitening is a successful and simple method of lightening the colour of your teeth. Its also very safe and involves no drilling!